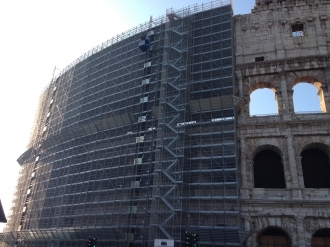 Two MB C 1000/150 units are working on the restoration of the Coliseum of Rome. The transport platforms have a 1000 kg maximum lift capacity and reach 40 m high with 12 stops each. The lifts will stay on site for 18 months to help in the €25 million renovation of the historic building.